If you really cut into that rainbow lame, I suggest using old scissors and a vacuum attachment. I’m going to have to hunt up a copy of this pattern (or something sufficiently similar) in my size. Every time you show one off I like it even better. ohhh…. disco diwashi needs to borrow the disco cape! Love the lame! Need the boots, it is almost time to put the flip-flops away for the season. I always peep at your blog as we share both dressmaking and language interests – but would be incredulous if this extends to stone masonry too! 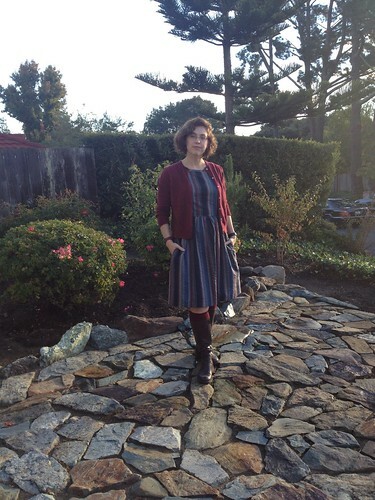 The stone paving work in your picture is very nice indeed – the perfect platform for autumnal dresses. Wonderful dress, yet again! I agree with you about how there’s really no good way to autumnize or winterize most spring and summer colors! I love it when people call women’s magazines out for their nonsensical advice. Anyway, this has nothing to do with anything but dresses really, but the women involved in the Petraeus affair wear really oddly tailored dresses! Do they buy them really large for their busts, and then have them tailored down where they can? Who puts inside-out darts on a neckline like that, and then doesn’t sew them all the way to the edge, so that they’re not smooth at the point? The sleeves are odd, too. I did not know there was fabric called Disconium, but I may have to get some. Please keep us apprised of the party dresses. “Juveniles! Vacate my greensward!” I love it! I like the colors of your dress. Fall is my favorite season, but I can’t wear seasonally appropriate warm clothing. I would be too warm at work since I work in a climate-controlled office. Maybe I need to quit my job and find something outdoorsy to do so I can wear the fabulous tweeds and cardigans. I’m with you. I love Autumn colors. (Who am I kidding, I love all colors..) And at all times of the year. As always, you are looking very retro-chic.